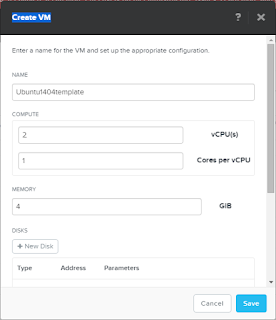 Getting started with a new provisioning platform like Acropolis on Nutanix can seem unfamiliar if you’ve spent many years with the way that vSphere creates virtual machines. However, you can bootstrap your environment with just a few VMs that allow you to clone and then set app configurations quickly. The most popular configuration management platforms you may already be familiar with, and in no particular order are Chef, Puppet, Ansible, and SaltStack. I’d like to begin with Ansible just as a relatively straightforward example. If you’d like a more thorough Ansible introduction, check here. After imaging a Nutanix cluster with the Acropolis Hypervisor (or AHV), you should create a container and storage pool so that you can immediately begin laying the baseline for your environment. First let's create a default template we can use, in this case, I am using Ubuntu. 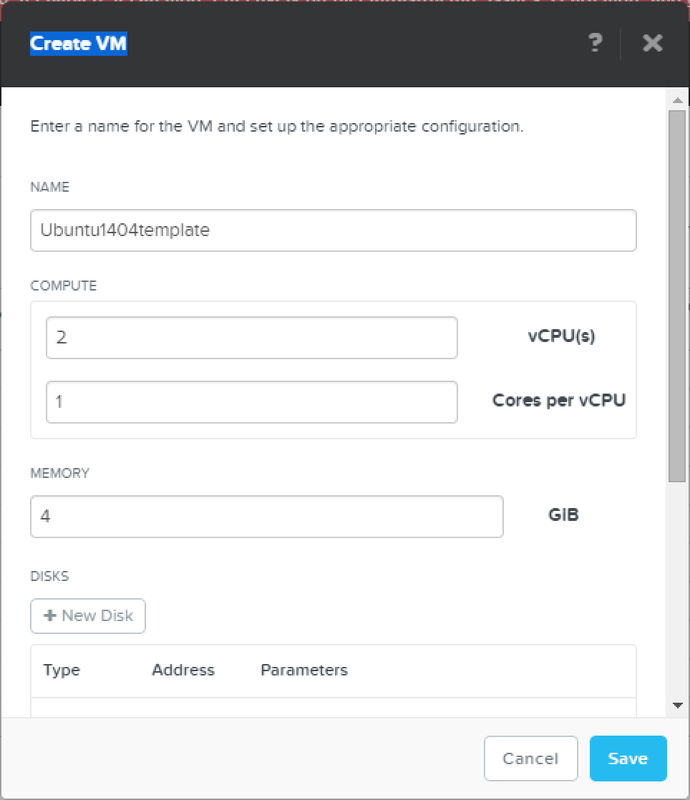 Upload the Ubuntu server ISO via sftp to port 2222 with user "admin" and your admin's password that you set for the Nutanix cluster. For example, on Windows I use WinSCP, and on Mac I use Cyberduck but feel free to use whatever client you are most familiar with. Optionally, once logged in you can create subdirectories to help organize but these are not required in the container. Create a new VM and feel free to customize the following: your local root disk size and vlan network attachment to the VM. Update the CDROM to “Clone from ADSF file” and use the path of uploaded ISO. This should auto-complete if you are using the correct path. For example "/container_name/ubuntu14.04.3-server-amd64.iso. If you have NOS version 4.1, this will look almost the same except for a cosmetic difference of "Clone from NDFS file". Power on the VM and install Ubuntu from ISO as you normally would. Feel free to customize what you wish to be used as part of a base template for your given OS at this point, but I would make sure to install OpenSSH Server. Detach the ISO from the VM and reboot. If you used DHCP, then you should see the VM now has an IP from the Acropolis GUI or use the static IP you assigned to SSH into the VM. You may also launch the console, but through my virtual desktop I was having keyboard translation issues so SSH avoids that just in case. 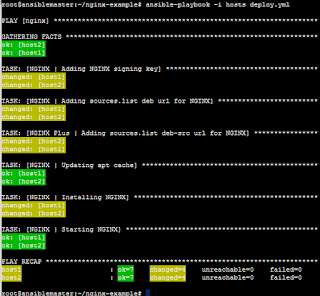 Now that we have a base template ready, we can use it to build our master Ansible server and any clients that we wish to overlay configurations. 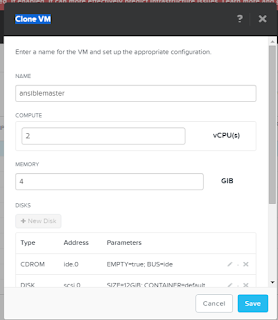 In the Acropolis GUI, clone the shutdown VM to a new VM, for example ‘ansiblemaster’ and power on. Also worth noting is that Ansible's playbooks could also be applicable when configuring other parts of your environment, for example even networking devices such as Cumulus Network switches, with more details from Github here.